Born in Chicago, IL and grew up in Burr Ridge, IL. Husband to Alaina Cramer and father to William and Cooper. Parents are Terry and Brenda Cramer. 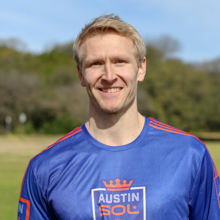 Played ultimate for Austin Doublewide 2013-2016 and Space City Ultimate 2010-2012. Played NCAA baseball at Rose-Hulman as an outfielder.